The Brecon Beacons (Welsh: Bannau Brycheiniog) is a mountain range in South Wales. 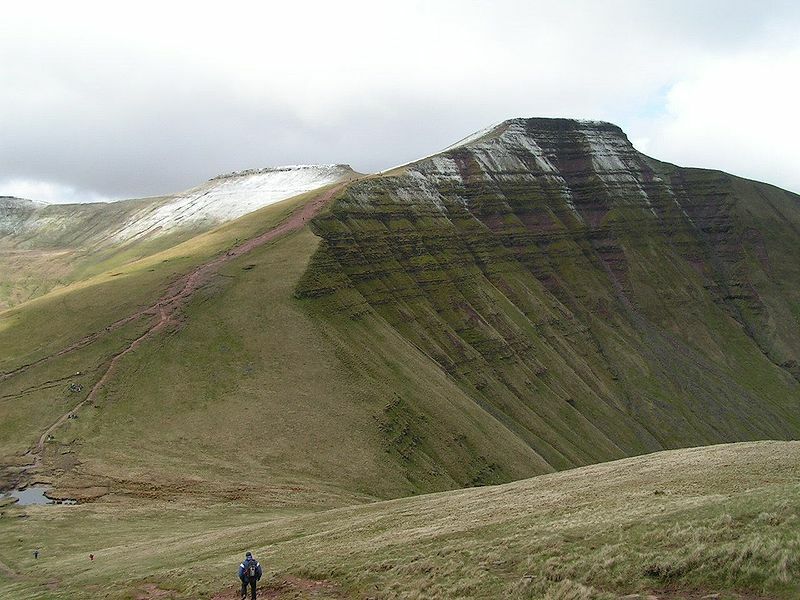 In a narrow sense, the name refers to the range of Old Red Sandstone peaks which lie to the south of Brecon. Sometimes referred to as "the central Beacons" they include South Wales' highest mountain, Pen y Fan. The range forms the central section of the Brecon Beacons National Park (Parc Cenedlaethol Bannau Brycheiniog), a designation which also encompasses ranges both to the east and the west of "the central Beacons". This much wider area is also commonly referred to as "the Brecon Beacons", and it includes the Black Mountains to the east as well as the similarly named but quite distinct Black Mountain to the west. The Brecon Beacons range, in its narrower sense comprises six main peaks: from west to east these are: Corn Du, 873 metres (2,864 ft), Pen y Fan, the highest peak, 886 metres (2,907 ft), Cribyn, 795 metres (2,608 ft), Fan y Big, 719 metres (2,359 ft), Bwlch y Ddwyallt, 754 metres (2,474 ft), and Waun Rydd 769 metres (2,523 ft). These summits form a long ridge, and the sections joining the first four form a horseshoe shape around the head of the Taf Fechan, which flows away to the southeast. To the northeast of the ridge, interspersed with long parallel spurs, are four cwms, four round-headed valleys or cirques; from west to east these are Cwm Sere, Cwm Cynwyn, Cwn Oergwm and Cwm Cwareli. The Brecon Beacons are said to be named after the ancient practice of lighting signal fires (beacons) on mountains to warn of attacks by invaders. The round of the Taf Fechan skyline forms a ridge walk commonly known as the Beacons Horseshoe. The area was inhabited during the Neolithic and the succeeding Bronze Age, the most obvious legacy of the latter being the numerous burial cairns which adorn the hills of the centre and west of the National Park. There are especially good examples of round barrows on Fan Brycheiniog, Pen y Fan and Corn Du. The former was excavated in 2002–4 and the ashes in the central cist dated to about 2000 BC using radiocarbon dating. A wreath of meadowsweet was likely placed in the burial. Over twenty hillforts were established in the area during the Iron Age. The largest, and indeed the largest in South Wales, were the pair of forts atop y Garn Goch near Bethlehem, Carmarthenshire – y Gaer Fawr and y Gaer Fach – literally "the big fort" and "the little fort". The forts are thought to have once been trading and political centres. When the Romans came to Wales in 43 AD, they stationed more than 600 soldiers in the area. Y Gaer, near the town of Brecon was their main base. During the Norman Conquest many castles were erected throughout the park. One of the most famous is Carreg Cennen Castle but there are many more. Brecon Castle is of Norman origin. There are many old tracks which were used over the centuries by drovers to take their cattle and geese to market in England. The drovers brought back gorse seed, which they sowed to provide food for their sheep. The area played a significant role during the Industrial Revolution as various raw materials including limestone, silica sand and ironstone were quarried for transport southwards to the furnaces of the industrialising South Wales Valleys. Sitting at the top of the beautiful Neath valley, Berthlwyd is an isolated upland farm in Powys with a history stretching back thousands of years. This valley has been farmed for thousands of years, and today is littered with the remains of previous inhabitants from the Bronze and Iron ages to medieval and later. On the southern boundary of Berthlwyd lies an Iron Age enclosure, listed as a Scheduled Ancient Monument (SAM). Numerous field boundaries in the form of walls and hedges are evidence of farming activity from the Iron Age right through to the present day, and a circular grain or root crop store on the edge of one of the lower meadows also possibly dates from the Iron Age. Records indicate there was a farmhouse at Berthlwyd as far back as 1662, when it was owned by William Beavan Rees. A few years later, a 1690 marriage settlement suggests that by this time the farm belonged to William Lewis of Hepstey. Later, in the 18th and 19th centuries it’s not clear who owned the farm – except for one reference in the Tithe Schedule of 1840 indicating Berthlwyd belonged to a Leyson Morgan. The National Trust bought Berthlwyd in 1992 and today the sixth generation of the same family to farm here are their tenants. To the west of Berthlwyd lies the River Nedd. The river runs through a spectacular, dramatic vertical-sided gorge, now largely dry as the Nedd follows an underground channel below the old river bed. The gorge was created as a result of a collapsed cave system. Underneath Berthlwyd Farm lies the Little Neath River Cave, one of the largest cave systems in the area and now a Site of Special Scientific Interest (SSSI). Sinkholes where underground caverns have collapsed are dotted throughout the area. Geologically, the farm sits on carboniferous limestone and remnants of limestone pavement (link to external website) can be found on the highest points, including the craggy outcrops at Garn Fawr and in the woodlands bordering the Nedd gorge. It’s this limestone, combined with a benign farming system that has given rise to such a rich and varied flora that is the hallmark of Berthlwyd Farm. If you are a special interest group, such as botany or history, and you would like to visit, please contact Joe Daggett. 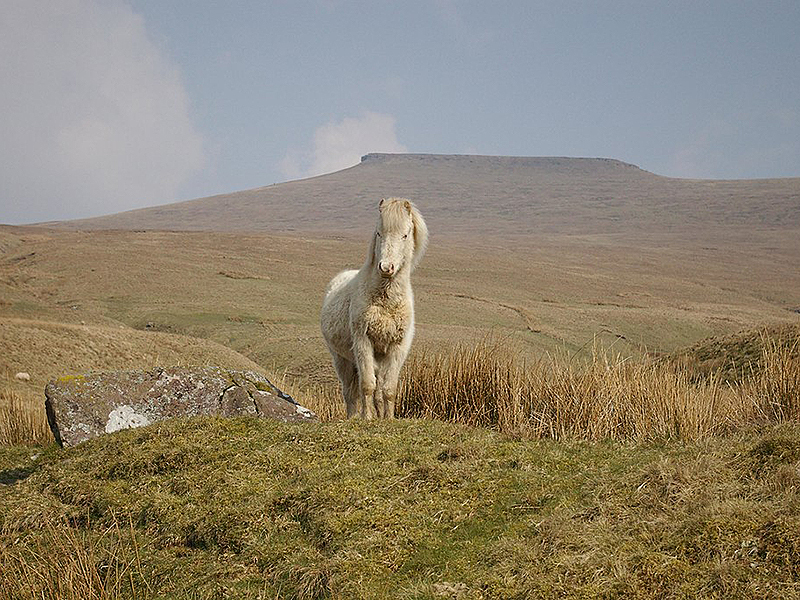 There are a number of spectacular walks, most over well-trodden footpaths, in the Brecon Beacons. Pen y Fan and Corn Du circular walk. A strenuous mountain walk on well-made footpaths to the summit of Pen y Fan and Corn Du. Take the footpath at the southern end of the car park, pass through the kissing gate and cross the wooden footbridge over the river. From here, follow the footpath uphill towards Bwlch Duwynt. As you take this steady climb up the footpath you'll notice the different methods of footpath construction used on the Brecon Beacons. The gullies on the uphill side of the path take the water flowing downhill to suitable crossing points were the NT have constructed culverts; this keeps most of the water off the footpath and prevents erosion. Some of the footpath has been stone pitched. This method of creating a hardwearing surface pre-dates Roman times, but is costly and very time consuming. Corn Du is the second highest peak in the Brecon Beacons. Often overshadowed by its more famous neighbour, Pen y Fan, it is nevertheless a beauty in its own right. Once you reach Bwlch Duwynt (which means 'Windy Pass' in Welsh), take the footpath at about 11 o'clock which leads across the southern slope of Corn Du. You'll soon reach the saddle between Corn Du and Pen y Fan. From here there are spectacular views to the south, down the Neuadd Valley to the reservoirs that are above Merthyr Tydfil. Continue along the footpath for the last push to the summit of southern Britain's highest mountain - Pen y Fan - at 2906 feet (886m). Pen y Fan is the highest mountain in southern Britain. Deservedly popular with walkers, the views from the summit are truly spectacular. It's often seen as the terminus of many walks but there are plenty of other Beacons worth exploring too. The cairn on the summit was a Bronze Age burial chamber. When it was excavated in 1991 a bronze brooch and spearhead were found inside the chamber. The views from the top are spectacular when weather permits. To the north, the town of Brecon can be seen and on a particularly good day the summit of Cadair Idris is just visible. Looking east you can just make out the Sugar Loaf in the far distance, and to the south-west the Bristol Channel at Porthcawl can be seen on a bright day. Once you've finished taking in the views, retrace your steps to the saddle in between Pen y Fan and Corn Du, and make your way up the pitched footpath to the summit plateau of Corn Du. The summit was once covered in peat and grass. The Neuadd valley and reservoir stretch away towards the south. The cairn on Corn Du was also a Bronze Age burial chamber. Looking north-west from here into the Cwm Llwch valley is Llyn Cwm Llwch. On the ridge line there's the Tommy Jones obelisk, a memorial to a five-year-old boy who died after getting lost on the Beacons in 1900. Leave Corn Du from the northern end and climb down the steep section to reach the pitched path below which heads towards the obelisk. After about 330yd (300m) the path divides. Take the permissive path to the left that heads down towards the stream, Blaen Taf Fawr. Once across the stream, head upwards following the path to the gate on the Gyrn. Y Gyrn has a considerable amount of heather on it, this is because the grazing by sheep and ponies is managed to promote a healthy habitat for upland birds like red grouse. Keep following the path and descend down to the A470 at Storey Arms. The old coach road is still visible on the right as you reach the gate. Turn left and follow the road back to Pont ar Daf car park. Classified by the National Trust as moderate, this walk covers 4 miles and should take about two and a half hours. It is dog friendly. Follow this glaciated valley down the 18th-century metalled track that was once the main road from the Midlands to Cardiff. This walk is rated moderate and takes about 3 hours covering 5 miles. It is dog friendly. Start the walk by crossing the road from the car park to be outside the Storey Arms (once a coaching inn, Storey Arms is now an outdoor education centre run by Cardiff Council). Take the track to the left of the centre down the valley towards Brecon and pass through a kissing gate and cross a stone bridge. Once you start walking down the coach road, be sure to look behind you at the dramatic view of Craig Cerrig Gleisiad, the glacial hollow overlooking the A470. It's now a National Nature Reserve looked after by Natural Resources Wales (NRW). Continue downhill along the coach road. On your left next to the river below the new main road you'll see stone built sheep pens. These pens were used to wash the sheep before taking them to market. Pass through a large gate and continue until you reach a stile on your left signposted for the youth hostel. Many of the veteran trees are visible from the old coach road running north from Storey Arms. From a distance they look like any other tree, but up close they’re hollow, gnarled and full of life. Alder, birch, rowan and oak are just a few of the species of trees in the valley. Once you have crossed the stile, walk down to the river and cross it by the wooden bridge. Just above the bridge are the remains of a Bronze Age burial chamber. Turn right and follow the fence above the river until you reach another stile. You now want to follow the path beside the fence along the river valley. You will cross several stiles and fields. Keep your eyes open as you are surrounded by wildlife as well as farm animals. River Tarell. The river is home to otters and dippers. Salmon and sewin (sea trout) have been known to swim up this river, quite some feat as the River Tarell flows into the River Usk which travels all the way to the sea at Newport. Look out for red kites, as they are also around. Keep the river and fence on your right until you come to the end of the fields. Go over the stile across the bridge and onto the tarmac road, turn right leading up and past the cottages called Old Glanryhd. Keeping straight ahead, the tarmac road will end at Blaen Glyn farm and the National Trust office. You are back on the metalled track of the old coach road, follow this all the way back up to Storey Arms. Picnic areas - no official picnic sites but there are nice spots for picnics throughout the area. Cwm Gwdi parking £3 cars, £6 minibus and campervans per day. Refreshment vans - at Storey Arms and at Pont ar Daf (most weekends) and in many lay-bys on the A470. Dogs are welcome as long as they are kept under control. Please take any mess home with you. Outdoor activity centres in the area such as Longtown Outdoor Education Centre. Organised local hunts during the winter, such as The Brecon Talybont Hunt. Toilets - Pont ar Daf car park (not National Trust). Parking - no marked accessible parking bays, but Cwm Gwdi car park is surfaced and level. Pathways and open space - access is by gate or stile. Mountain paths are sloped, uneven and a mixture of grass, gravelled and stone pitched surfaces, which vary in width. Visual information - five information boards at Storey Arms, Pont ar Daf, Cwm Gwdi and the Tarell Valley footpath.